Oil painting: Robbing the Bird’s Nest by Pieter Brueghel the Younger, oil on panel. This little oval is based on a larger, rectangular painting by Pieter Bruegel the Elder. 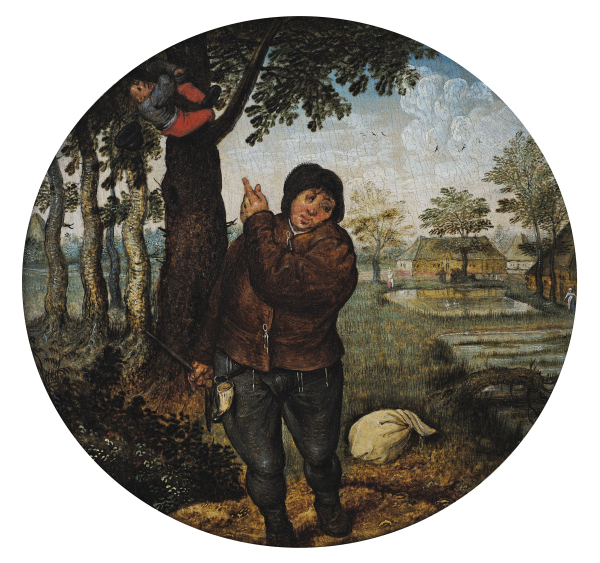 A peasant with a sack by his feet points towards a tree. There a thief, robbing a nest, clings to a branch as his hat falls off. The painting probably points to a moral contrasting the precarious position of the thief with the peasant on the ground. Meanwhile, in the background, women can be seen among fishponds and thatched houses, while a pair of white swans floats on the water.